We’ve written about adblockers time and again here on Techaeris, as more and more users are steering towards using apps that block ads when they visit websites. 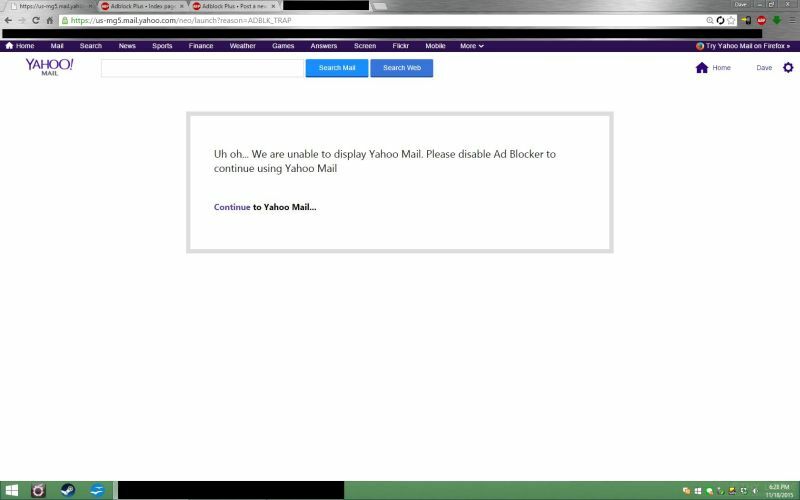 A small group of Yahoo Mail users found out yesterday that they had been blocked from Yahoo Mail, all because they were using Adblock Plus, a popular adblocker. Ads are an income staple for many websites, but in a lot of cases have become overwhelmingly intrusive on various sites which has increased the use of adblocker apps by users. By blocking the ads on the page, not only are they reducing the income received by website owners, but also reducing the income to the companies that serve the ads as well. According to a poster on the Adblock Plus forums, he was greeted with the screen below after loading up his Yahoo mail page in his browser. I confirmed with two other Yahoo Mail users that this is happening for them. I just wanted to bring it to ABP’s attention since I could not find any discussion about it anywhere. And as long as you don’t leave the mail page altogether and come back, it won’t bother you again. Seems whoever implemented this did a bad job of it. A Yahoo spokesperson confirmed to Engadget that they are testing out the functionality on a small number of Yahoo Mail users. Of course, affected users took to Twitter to complain about the new “feature,” including Yahoo’s former Senior Director of Product Design. Were you affected by Yahoo’s test? What do you think about Yahoo implementing a feature like this? Let us know in the comments below, or on Google+, Twitter, or Facebook.